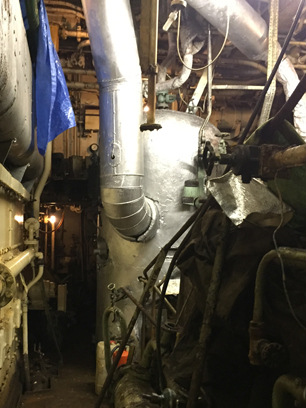 Deep down in the engine room is the liver oil burner, pictured above left, which was used for producing the oil. Once the fish had been gutted on deck their livers were washed and processed resulting in raw liver oil which could also be sold on return to port. Via a series of pipework and pumps the liver oil was pumped from the liver oil boiler to the far end of the Stern into a storage compartment (2 levels / approx 8m deep), pictured above right. If you are visiting the Ross Revenge try standimg at the far Stern end of the ship, walk back 2 metres and you get a feeling for just how large this storage compartment was. 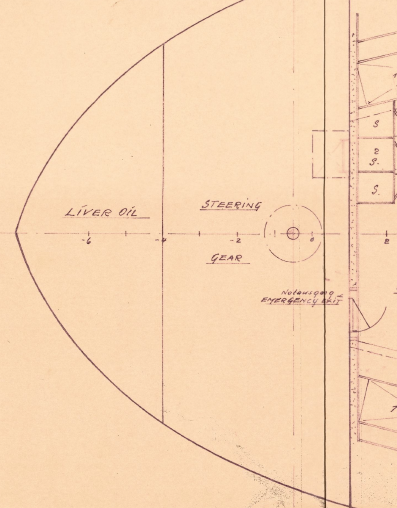 At the height of the trawler fishing period almost all of the larger trawlers would either collect the fish livers in barrels, or in the case of the Ross Revenge process the livers in a boiler and store for offloading on return to port. It was widely accepted that a proportion of the money earnt from this process would have a been a crew perk. 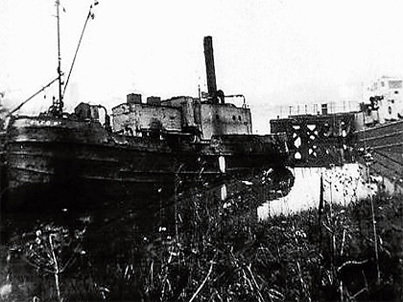 As with most fishing ports, Grimsby - home of the Ross Revenge - had its own liver processing facility owned by Grimsby Cod Liver Oil Co. Once the trawlers had returned to port, barges would pull along side and the raw liver oil was pumped onto the barge. Pictured opposite is Oilco 7 barge owned by Grimsby Cod Liver Oil Co. circa 1967.